Look at this picture. Do you see me smiling? 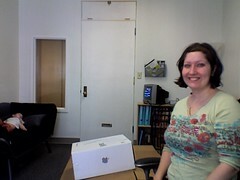 I am smiling because we finally have office furniture. More than one person can sit down at the same time. And no one has to sit on the floor! This, my friends, is progress. Also progressive: baby, sleeping. He really needed a nap. Really. Now that there is a place I can park Happy Fun Baby while he sleeps, I can actually do things in the office. Things like work. I know! Crazy talk. Today, for example, I have checked my e-mail, read my rss feeds, set up the wee little TV/DVD combo, and rearranged the desk. Not work in the classic sense of the word, perhaps, but still nice. Currently I am somewhat less than thrilled with the speed of our internet, but since I left my phone at home I can’t call and sweetly request that I get some sort of boost. Yes, you read that right: I left my phone at home. My lovely Blackberry Pearl is sitting on the charger even as we speak, lonely, abandoned. I will be back for you, phone! I have not forgotten you! (Except that I did, obviously.) I feel so…disconnected. And somewhat naked. You know that feeling when you realize you’ve left the house without a bra? Only none of my bras can check my e-mail, and maybe that’s the crux of the problem right there. I had some high hopes for this afternoon, many of which involved going to Shoefly and seeing if they had any cute clearance shoes in my size, but instead I am browsing the interwebs while my kid sleeps. It works.